Are you a teenage boy and looking for funky hairstyles ideas? Then this is the right place for you to learn new funky styles that you would love. Don’t forget to scroll down to read the entire post for some latest hair styling ideas.Trying these hairstyles with funky outfits can bring a real swag for men. In the last post, we talked about 90 Famous Hairstyle that are trending these days.Boys usually copy hairstyles from their favorite television shows or a celebrity inspiration. They take ideas from the magazines and through the internet. Boys having curly hair can style an afro look in a funky way. Apart from that, they can also straighten their hair by using straightening machines. You can find them anywhere at a cosmetic store or at a departmental store.So a little effort can change and enhance your look. Plenty of styling ideas are also available online from where you could watch and learn new ideas about funky looks. In order to leave a positive impression on others, you should go well dressed and not forget that hair is an important factor of one’s personality. Young boys always prefer to have funky styles whether it’s dressing or their hairstyle. They go with the easiest hairstyles and the ones that are perfect for their daily routine. A cool hairstyle can change your entire look.Whether you are heading to an event or for a hangout with friends, you should always pay much attention to your hairstyle as it is an essential part after dressing. If your hairstyle is not up to the mark, you will not look complete. Men have to be constantly on the go when they are out and have to look good. Therefore moving out of their house with a hairstyle that suits them becomes a necessary part. Also, guys are always ready to try up different hair styles no matter what the outcome may look like. Young boys are usually seen with new styles such as spiked haircut, side haircut, formal look, short buzz, half colored, half bangs etc. One should always experiment with it. Whether it is about the haircut, hair color or hair style. We will be sharing some funky hair styles pictures that you wouldn’t be able to ignore at all. Below we have arranged some of the pictures (via) of hairstyles that are not just easy but very trendy and unique. From bangs, curls, afro look too spiky hair. You will surely love these ideas. Hopefully, you will find these pictures very helpful. This style is the right one for guys who can carry away this kind of bold styles either it is in their dressing or in their hair styles. If you think you are bold enough to make the style look perfect on you then you should get this hairstyle. 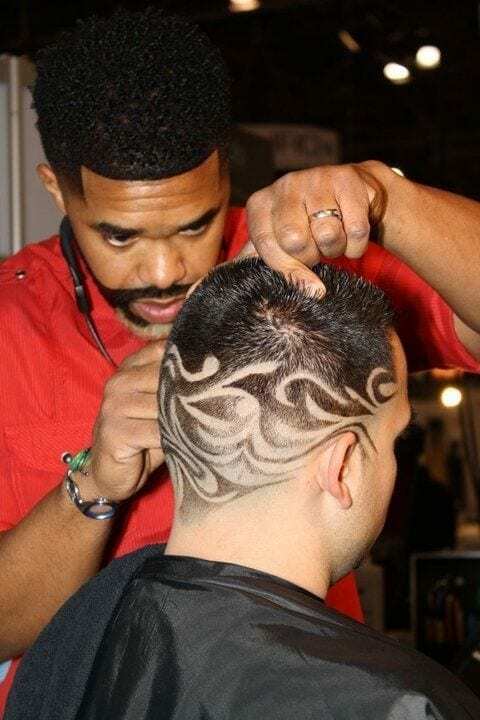 Simply, go for a bald haircut but only on the lower parts of your head, then ask your barber to use a razor and make unique patterns. Just like the ones that are used in tattoos. This pattern on your head will make your hairstyle extremely unique and funky and everyone will for sure ask yours about it. Men can also color their hair and style them with their preference. Different kind of hair colors is also available in the markets. To get some distinctive haircuts and styles, you can visit a salon and get your hair styled by professional. A long time ago African braided hair used to be a taboo but not anymore. People from around the world are now getting this braided hair that originated from Africa and apparently, everyone is loving them too. Thye can be your next fav haircut too just give them a try and see what happens. It doesn’t matter it you are white, you can still opt for braided hair if you feel like getting them. The lengthy tousled hairstyle looks very flirtatious on every guy despite their age. For example, you are going to a party and you want to hook up with some girls, then this swag hairstyle is definitely for you. All you have to do is to keep your hair quite long from the middle section of your hair, but keep them short from the sides of your head. You can the tousle the longer section of your hair and make them look messy so that they will exhibit flirtatious vibes. A perfect hairstyle will make you gain everyone’s attention. If you plan to enhance your looks then spend some time on styling your hair. Hairstyles keep changing time to time. Teenage boys who have short, medium or long hair can try out a million ways to style their hair. From Korean celebrities to Hollywood celebrities, we have seen everyone going for pink hair color. And yes they look just awesome if they are well managed. The trick here is that yu should know how to keep your pink hair in good condition and how to carry them as well. As far as the haircut is concerned, you can go for the cut with shorter hair around the sides of your head. 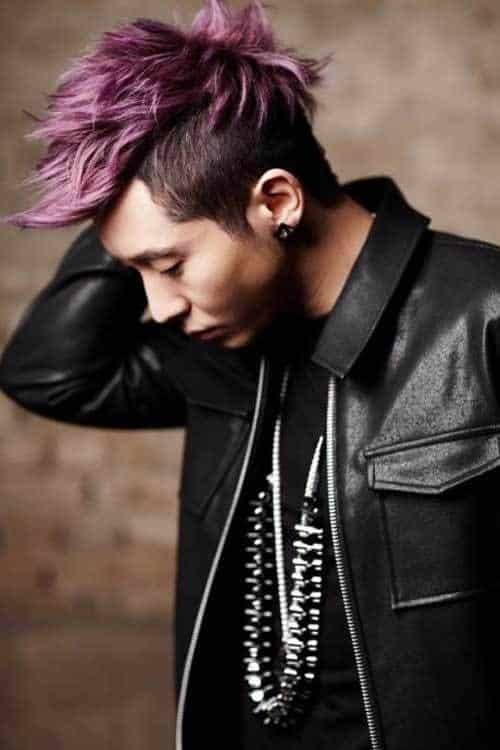 This haircut looks the best with pink hair color. This hairstyle look is wearable to college as well. You won’t be needing to spend extra 2 hours just to get your hairstyle right but this hairstyle can be prepared in only minutes. You can use hair gel to keep your hair firmly in place. Everyone seems to be inspired from long hair of Jonny Depp. And they are very very easy to replicate as well. The best way to make long hair work and to get highlights on them to make them look more vibrant and eye catching. This way your long hair will look funky too with a mixture of elegance in them. You can go for blonde of chocolate brown highlights etc, depending on the color of your hair and your skin. This parted hair look is perfect for funky guys and looks like the best combo with mustaches. You can also use hair gel to make your parted hair look more crisp and firm.